If you feel like escaping to Europe but don't want to leave North America, you can take your kids to Montreal, a French-language city in Quebec that brims over with family-friendly charm. Montreal is known for its rich cultural heritage and diversity as well as its penchant for throwing some of the country's biggest festivals and events. including the International Jazz Festival, Just for Laughs comedy festival, and the International des Feux Loto-Québec, a competition in pyrotechnics that takes place every July. There are myriad kid-friendly attractions in Montreal, and as a festival city, Montreal offers a lot of activities that are appropriate for all ages year-round. Whether you're staying at a family-friendly hotel in Downtown or renting out an entire apartment in Old Montreal there's bound to be something nearby you and your children can do. The oldest quarter in the city, Vieux Montreal, is the perfect place to call home on your vacation to Montreal due to its wide variety of family-friendly restaurants, activities, and accommodations. Not only that, Old Montreal is centrally located, making it ideal for getting to and from if you decide to venture elsewhere. 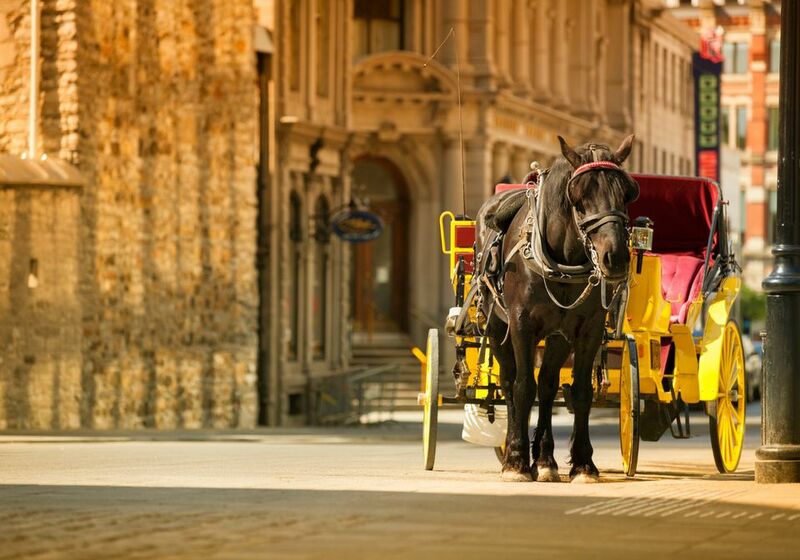 In Old Montreal, you can get a ride in a horse-drawn carriage or download the Cité Mémoire app to your smartphone for a fun 60- or 90-minute guided walking tour of Old Montreal. With shops for all ages and historic landmarks scattered throughout, you could easily spend an entire day wandering the cobblestone streets of this historic quarter. Don't miss a stop at Place d'Armes and the Notre-Dame Basilica, one of the most dramatic examples of Gothic Revival architecture in the world. The church's interior is tremendous and sumptuous, with deep-blue ceilings decorated with golden stars and hundreds of intricate wooden carvings throughout. What's unusual about this church is that its stained-glass windows depict scenes from Montreal's history rather than from the Bible. Offering interactive fun for kids of all ages, the Montreal Science Centre is located on the King Edward Pier in the Old Port area of the city, just below the quaint streets of Old Montreal along the shores of the St. Lawrence River. Boasted as one of the best science centers in the country, you're sure to get your money's worth out of a visit to this attraction. Permanent exhibits offer plenty of opportunities for kids to run around cranking, popping, and pulling at objects that demonstrate scientific principles. The Science Centre also contains an IMAX theater as well as creative, temporary exhibits designed to teach in a fun way. Additionally, the museum hosts several seasonal, annual, and one-off events throughout the year—many of which are family-friendly, too. Montreal is a city of festivals and live performances, but if you have to choose just one show, then let it be Cirque du Soleil. Long before it became a worldwide sensation, the "Circus of the Sun" was founded in Montreal and continues to play a huge role in the arts scene here. Kids and adults alike will be dazzled by shows that combine acrobatics, mind-boggling choreography, eye-popping stunts, and spellbinding costumes and sets. In July each year, the city also hosts the Montréal Cirque Festival, an international event geared toward circus arts and performance. There are as many as seven other touring circus companies that come to the city throughout the year including Cirque Corteo, Cirque Cavalia, and Cirque Eloize. If you're looking to show your kids a great view of the city, you can head to the Montreal Tower in Olympic Park. Rising 541 feet above the Olympic Park Sports Complex and built on a 45-degree angle, Montreal Tower is the world's tallest leaning tower. You can take a two-story cable car to the Montreal Tower Observatory, where you're rewarded with a panoramic view stretching up to 50 miles in every direction. The base of the tower houses the Olympic Park Sports Centre, which features seven water basins for sports such as kayaking, rowing, and swimming. There is also a gift shop located in the Tourist Hall during the busy summer season and plenty of nearby cafes and restaurants to enjoy. Guided tours of the entire attraction are also available. Although many residents and tourists have cars in Montreal, the city is rather easy to navigate on foot or on a bicycle. If you want to get your family out for some fresh air and exercise, you can rent bikes (or take a guided bike tour) from Ca Roule Montreal at 27 De la Commune East Street in Old Montreal and take them on a scenic ride along the Lachine Canal Bike Path. From the bike shop, you'll ride directly alongside the canal beyond Downtown Montreal to Parc René-Levesque. Along the way, you'll pass the St. Lawrence Seaway and Lake Saint-Louis as well as old mills and grain elevators that line the waterway. You might even see a few boats waiting for the water to rise at locks in the canal, allowing them to pass through the city. The entire trip to Parc René-Levesque and back to Ca Roule Montreal is about 18 miles, which should take about two to three hours to complete—depending on how fast you want to take it. If you're hungry along the way, you can cross the small bridge over the Lachine Canal and head to the Marche Atwater for picnic staples such as cheese, fruits, bread, and other tasty snacks. Located on Ile Sainte-Helene, a small island near downtown Montreal, a trip to La Ronde theme park is a great way to have a day-long adventure with your family without leaving the city. Opened in 1967 as the entertainment complex for the World's Fair, La Ronde is now owned and operated by Six Flags and one of Montreal's biggest attractions in the summertime, hosting several festivals, events, and special competitions including the International des Feux Loto-Québec. La Ronde has something for everyone in your family, from huge roller coaster rides to a kid's are known as Ribambelle's Land, where the thrills are tailored to small children. If you are planning to visit with your kids more than once this summer, you can possibly save money by buying a family season pass, which allows an unlimited number of trips to the park. For families traveling with slightly older kids who want a more active kind of thrill, you can head over to Old Port's Montreal Zipline, Canada's first urban zip line circuit, which lets you zoom over Bonsecours Island and is open to adults and kids age 7 and up. Right next door, there is a pirate-themed Voiles en Voiles ropes adventure course with seven aerial routes that connect two huge sailing ships. Originally constructed as a velodrome (an arena for track cycling) to host the 1976 Olympic Games, the building that currently hosts this appealing indoor botanical garden and zoo reopened as the Montreal Biodome in 1992. Here, you and your family can spend the day strolling through four different ecosystems found within North America, starting with a lush tropical rainforest. In the indoor Laurentian Maple Forest, maple trees actually change color in the fall, lose their leaves, and get buds in spring. The Gulf of St. Lawrence area provides both surface and underwater views, which is a delight for kids who love to see diving ducks and egrets. The stars of the Biodome, however, are the puffins and penguins in the Subpolar Regions. WARNING: The Montreal Biodome is undergoing renovations in 2018 and will not be open until some time in 2019.